Roasting salmon and broccoli together on a single baking sheet makes a quick and easy weeknight dinner. The lemon-garlic seasoned fish is flavorful and will surely leave you satisfied. All you need for perfectly seasoned and flavorful salmon is salt, pepper, garlic and lemon. A little more salt and pepper over some broccoli and you are done! If you are following a low-carb or Whole30 diet, an easy dinner like this is a lifesaver! If you don't have a any parchment paper on hand, try using non-stick foil. Either way, cleanup is a breeze! Per Serving: 294 calories; 18g fat; 20.6g carbohydrates; 17g protein; 36mg cholesterol; 894mg sodium. 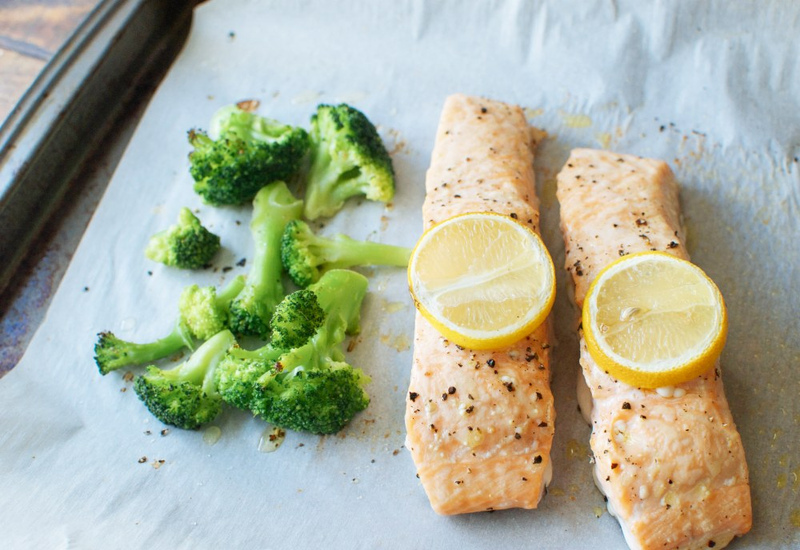 This sheet pan salmon and broccoli was so incredibly easy to make, why didn't I think of this before?! It's light and healthy, and takes less than 30 minutes. The garlic, sea salt, and pepper are simple ingredients that lend great flavor to this dish. I squeeze a little extra lemon juice on top for flavor, and my meal is complete! This is definitely on our weekly rotation now. Literally the easiest salmon recipe ever! Why did I never think to make sheet pan salmon before?! Five ingredients, simple, and super quick. I'm winning at this weeknight dinner thing! This recipe was way too easy be this good. I love sheet pan dishes because I'm lazy and this is no clean up. I will definitely make this again. There's not much to this recipe, it's really easy to make. I did asparagus instead of broccoli and it was fantastic. Next time I'll make this for meal prep. I took this recipe to the next level by roasting salmon and shrimp together with broccoli. Lemon and garlic were the perfect pair, I loved it. Doesn't get easier than this.